By Graig Graziosi | June 9, 2018 at 12:01a.m. A total of 66 students graduated from Choffin’s three health care programs this year. There were 33 practical nursing students, 15 dental assistant students and 18 surgical technology students. The auditorium at the D’Yor was full of friends and family excited to watch their loved ones complete their time at Choffin. 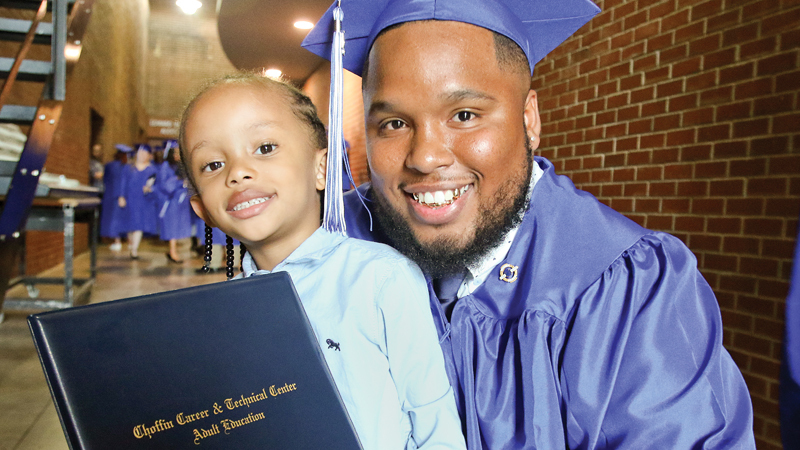 Students finishing their career-training programs at Choffin Career & Technical Center turned their tassels and celebrated another life milestone during the school’s commencement ceremony at the DeYor Performing Arts Center downtown. A total of 66 students graduated from Choffin’s three health care programs this year. There were 33 practical nursing students, 15 dental assistant students and 18 surgical technology students. The DeYor auditorium Friday was full of friends and family excited to watch their loved ones complete their time at Choffin. Michael Miterko, a graduating nursing student, was the recipient of the school’s Bedside Nursing Award. “Its amazing to be finished. It’s a privilege to be here, now I’m ready to go ‘be the nurse’ to borrow a phrase from my instructors,” he said. Miterko works at Cortland Healthcare Center and will begin school at Kent State University in the fall, where he hopes to build on his nursing training to become a pediatric nurse. Tanqueray Williams graduated from the surgical technology program, and said she plans to keep working at her job at St. Elizabeth Youngstown Hospital. Evie Thomas was the dental school’s valedictorian, and was relieved to move into her chosen career field. “Right now I’m going to go back to my full-time job and hopefully soon find a position in a dental office,” she said. The school invited Paul Olivier, senior vice president and chief networking integration officer at Mercy Health-Youngstown, to deliver the evening’s commencement address. He spoke of the need for health care professionals, the changing face of the industry and the introduction of new technologies, and exhorted the students to go beyond seeing their new career paths as simply jobs. “Choffin gave you the tools, and you brought the talent, now combine those with heart,” he said. October 9, 2007 2 a.m.
May 26, 2018 12:01 a.m.
February 6, 2015 12:02 a.m.